Definition: Parkinson’s disease (PD) is a long-term degenerative disorder, which is caused by the death of certain nerve cells in the brain. Symptoms start gradually, sometimes starting with a barely noticeable tremor in just one hand. Tremors are common, but the disorder also commonly causes stiffness or slowing of movement. Thinking and behavioral problems may also occur. Dementia becomes common in the advanced stages of the disease. Depression and anxiety are also common, occurring in more than a third of people with PD. Other symptoms include sensory, sleep, and emotional problems. 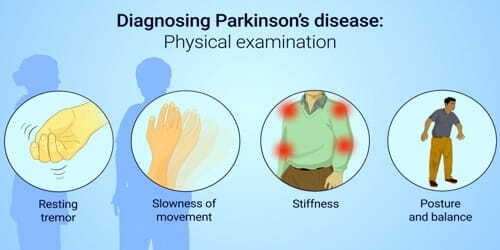 The main motor symptoms are collectively called “parkinsonism”, or a “parkinsonian syndrome”. The cause of Parkinson’s disease is not yet known. Both genetic and environmental factors may be involved. The disease worsens with time. There is no cure for Parkinson’s disease, but its symptoms can be treated. Treatments to slow the advance of the disease are also being developed. Some medications – such as antipsychotics used to treat severe paranoia and schizophrenia can cause Parkinsonism (symptoms that resemble Parkinson’s disease). 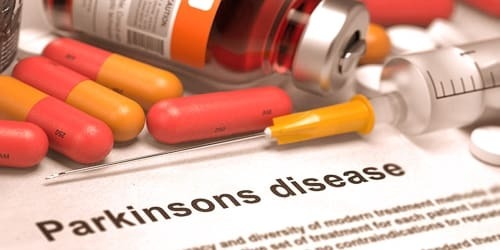 Diagnosis and Treatment of Parkinson’s disease: There is no specific test for Parkinson’s disease (PD), making it sometimes a difficult condition to diagnose, especially early on. The doctor may suggest a specific single-photon emission computerized tomography SPECT scan called a dopamine transporter (DAT) scan. Most people do not require a DAT scan. People may be given levodopa, with any resulting improvement in motor impairment helping to confirm the PD diagnosis. The finding of Lewy bodies in the midbrain on autopsy is usually considered final proof that the person had PD. The doctor may order lab tests, such as blood tests, to rule out other conditions that may be causing the patient’s symptoms. When PD diagnoses are checked by autopsy, movement disorders experts are found on average to be 79.6% accurate at initial assessment and 83.9% accurate after they have refined their diagnosis at a follow-up examination. When clinical diagnoses performed mainly by nonexperts are checked by autopsy, average accuracy is 73.8%. Overall, 80.6% of PD diagnoses are accurate, and 82.7% of diagnoses using the Brain Bank criteria are accurate. Sometimes it takes time to diagnose Parkinson’s disease. Doctors may recommend regular follow-up appointments with neurologists trained in movement disorders to evaluate the patient’s condition and symptoms over time and diagnose Parkinson’s disease. There is currently no cure for Parkinson’s disease. But medications can help control patient’s symptoms, often dramatically. In some later cases, surgery may be advised. Therapy focuses on treating the symptoms that undermine the patient’s quality of life. There are various medications that can help the symptoms of Parkinson’s disease. A frequently used medication is Sinemet (levodopa/carbidopa) which the brain converts into dopamine to help with movement. Other medications make Sinemet more effective (e.g. Comtan, Azilect). Yet other medications act like dopamine (agonists, e.g. Mirapex, Requip). Treating motor symptoms with surgery was once a common practice, but since the discovery of levodopa, the number of operations has declined. Surgery for PD can be divided into two main groups: lesional and deep brain stimulation (DBS). Target areas for DBS or lesions include the thalamus, the globus pallidus or the subthalamic nucleus. Exercise is crucial for maintaining function. Physical therapy can help the patient improve mobility, a range of motion, as well as muscle tone. Physical therapy cannot stop the progression of Parkinson’s disease, but it can help the patient cope and feel better. Gene therapy typically involves the use of a non-infectious virus (i.e., a viral vector such as the adeno-associated virus) to shuttle genetic material into a part of the brain. The gene used leads to the production of an enzyme that helps to manage PD symptoms or protects the brain from further damage. A balanced diet also provides nutrients, such as omega-3 fatty acids, that might be beneficial for people with Parkinson’s disease. 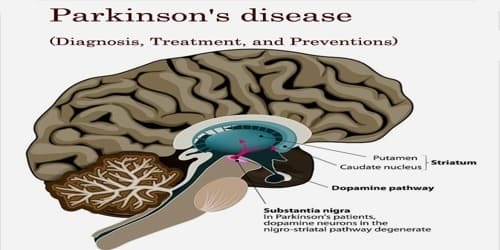 Preventions of Parkinson’s disease: Because the cause of Parkinson’s is unknown, proven ways to prevent the disease also remain a mystery. 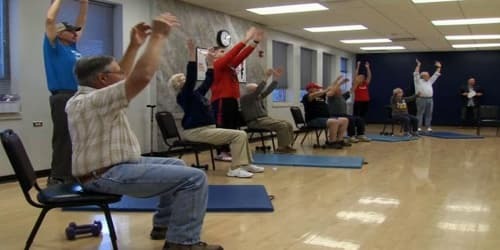 Exercise in middle age may reduce the risk of Parkinson’s disease later in life. Caffeine also appears protective with a greater decrease in risk occurring with a larger intake of caffeinated beverages such as coffee. However, it is still not known whether caffeine actually protects against getting Parkinson’s, or is related in some other way. Currently, there is not enough evidence to suggest drinking caffeinated beverages to protect against Parkinson’s. Green tea is also related to a reduced risk of developing Parkinson’s disease. Antioxidants, such as vitamins C and E, have been proposed to protect against the disease, but results of studies have been contradictory and no positive effect has been proven.